HOW CONFIDENT IS YOUR BRAND? The CLEAR AS_*Reality Creator program provides a detailed description of your business’ desired future. This precise representation of your bespoke future serves as a solid substructure for reality creation, the process of moving your business from its current to its Desired Future State. Key in this process is the use of your brand as an alias of your company’s coveted future self. 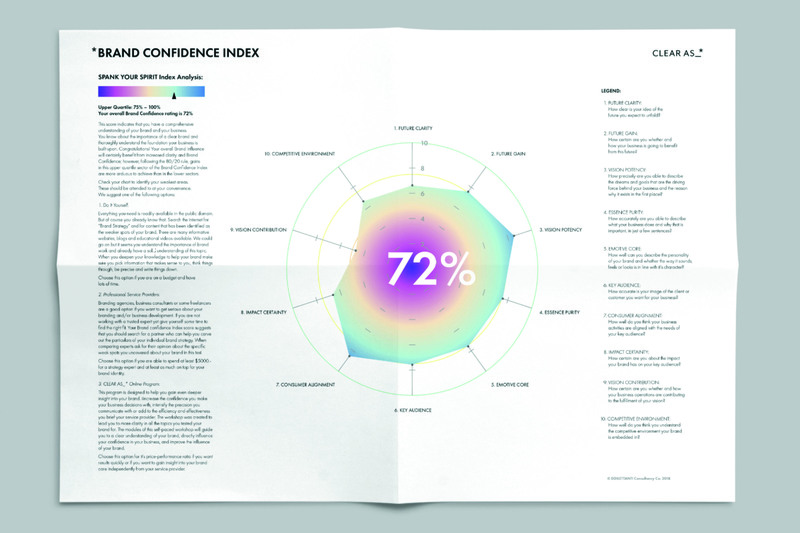 We developed the BRAND CONFIDENCE INDEX (BCI) as an assessment tool to determine the status quo of corporate clarity and in order to make progress in reality creation measurable. We are looking for businesses to take advantage of this complimentary service in order to help us raise awareness for reality creation and support our efforts in creating a knowledge base.